If Wagner is something special at the Munich Staatsoper (see Dutchman review), Richard Strauss's operas are more special, still, in that town that was 'his' at the dawn and dusk of his career. It was the town he wrote "Die Feuersnot" against, being appalled at how his genius was not duly recognized in the provincial (yet cosmopolitan) capital of Bavaria, and it was the town to which he returned in the autumn of his life. While most of his operas (nine out of fifteen) have been premiered in Dresden, and although one of the two Strauss operas premiered in Munich was the not-to-be-proud-of-being-associated-with "Der Friedenstag" ("Day of Peace" - the other, however, is Strauss' operatic swan-song and one of my personal favorites: "Capriccio"), the links between city and the artist's music are strong. Well beyond the point of pride that goes along with premiering important works, Munich has simply taken to the composer in ways that few other houses and cities have - or so it seems whenever the house opens its doors to yet another performance of his works. R. Strauss, Der Rosenkavalier, C.Kleiber, G.Jones, B.Fassbaender, L.Popp et al. 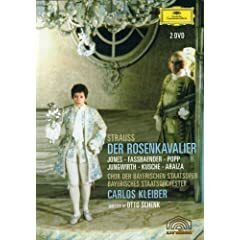 You can see Munich's Rosenkavalier on DVD with Carlos Kleiber conducting a 1979 performance that is to be preferred even over his starrier 1994 performance from Vienna (also directed by Otto Schenk) - not the least because of a sublime Brigitte Fassbaender as Octavian and because Gwyneth Jones' Marschallin, whether you like here elsewhere or not, is astounding. The Vienna cast features Anne Sofie von Otter and Felicity Lott, respectively - which is fabulous in its own right. Munich's Manfred Jungwirth needs not to shy from comparison with Vienna's Kurt Moll (the latter is my favorite - though I prefer younger Ochs' altogether). Only Lucia Popp isn't exactly the lass that I see Octavian falling for, over the Marschallin - but she's not more off-putting than Barbara Bonney in the Vienna production and sings better, still. Last month, the Staatsoper presented its Rosenkavalier with a cast that could challenge any and all others - live or on DVD. With Adrianne Pieczonka, Munich may have found a new favorite Marschallin. Sophie Koch's Octavian was a happy combination of excellent (and believable!) acting and singing. Diana Damrau was the most sublime Sophie. Eike Wilm Schulte as Herr von Faninal (wonderful in the Washington Daphne) and John Tomlinson as Baron Ochs just about held their own against such a formidable female cast. The female trio, in whichever combination, was able to move to tears- to present the highly intelligent libretto in its best and most realistic light- to give the already glorious music that last touch that elevates it to pure genius. The sincerity, the nuances, the clarity, the warmth and melancholia (Pieczonka), the excited, naive yet also knowing (Damrau), the boyishly eager and earnest (Koch) were such, that the characters were recreated in front of the audience, despite the models and idols of the past and all the audience's preconceived notions and expectations. I know that I will consider myself very lucky should I ever hear such a fine female cast in a live Rosenkavalier again. All pictures courtesy of the Staatsoper München. Photos by Wilfried Hösl. And the Winner Is? Tony Shore!